As a vital piece of safety equipment, fire extinguishers must be installed in accordance with Australian Standard AS 2444 and maintained on a six monthly basis in accordance with Australian Standard AS 1851. This equipment is generally used as a first attack measure to ensure the fire does not spread in the early stages and cause significant damage. It is very important this equipment is serviced correctly. The Carbon Dioxide (CO2) extinguisher is recommended for use on electrical equipment and suitable for Class E electrical hazard fires. Carbon Dioxide fire extinguishers also have limited capabilities for extinguishing small, indoor Class B flammable liquid and Class A fires. Wet Chemical extinguishers utilise an aqueous solution discharged in a fine spray to the surface of Class F fires. The agent reacts with the burning oil or fat, forming a blanket which extinguishes the flame by creating a saponifying action and changing the burning liquid into a soap like substance. Once used, as the solution is usually alkaline, it is recommended the surface be cleaned and all residue removed within a reasonable time period. Dry Chemical Powder fire extinguishers (DCP’s) are the most widely used fire extinguishers, suitable for use on many types of fires. The compact nature of these fire extinguishers, ranging from the 1.0kg domestic model up to the 9.0kg industrial model, enables them to be utilised in numerous applications. These extinguishers contain a concentrate mixed with water, which produces foam when discharged. Foam extinguishers are effective against Class A & B fires involving paper, textiles, wood, plastics, rubber, petrol, oil and paints. The foam provides a blanket covering when utilised on flammable liquid or carbonaceous fires assisting with the exclusion of oxygen and thus reducing the ability of fuel to continue burning. A very efficient and cost effective method to combat certain types of fires, the normal capacity of this type of fire extinguisher is 9.0 litres. Water acts to reduce the temperature of the burning fuel so it is below its ignition point. Water extinguishers are efficient and cost effective against Class A fires involving paper, textiles, wood, plastics and rubber. 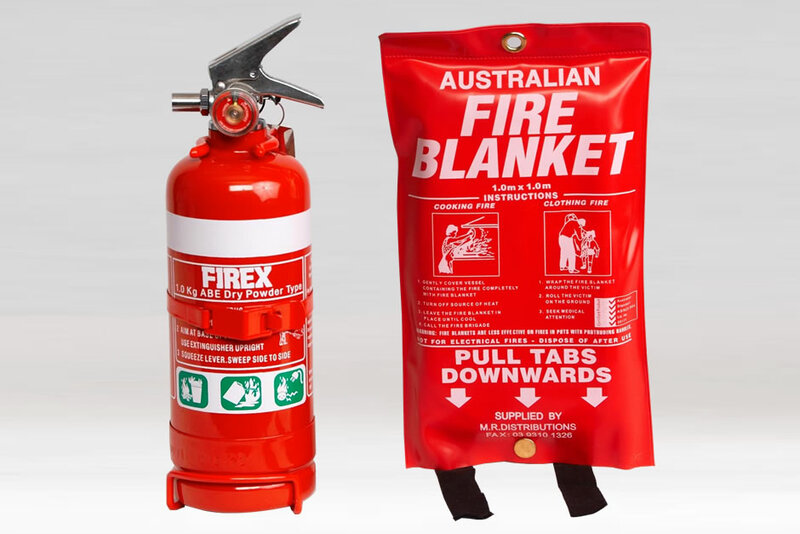 Our fire blankets are compact, portable and light weight and comply with Australian standards. They are available in quick release soft pouches and plastic cases.